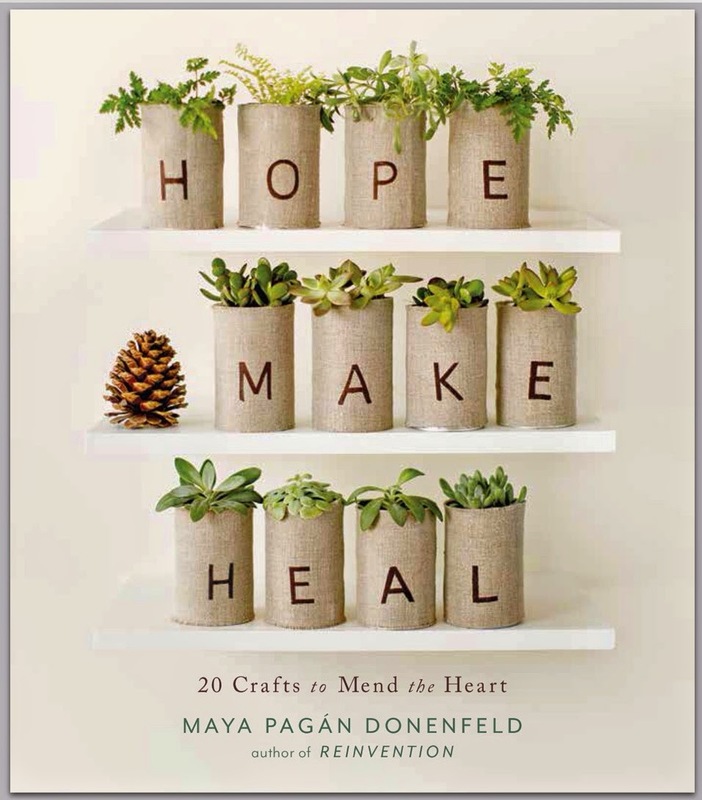 My studio is filled with baskets of burlap scraps organized by size. I have a bunch of ideas... besides my favorite pincushions. 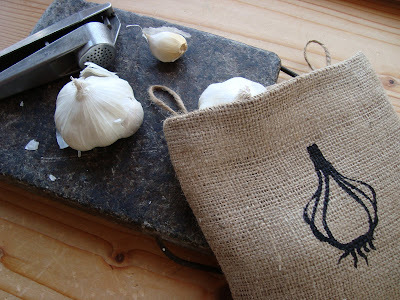 My mother had an idea I hadn't even thought about: a garlic sack. I decided to give it a try last week and we all loved it. I thought others might, too... so I made another. I couldn't help but want a larger one for my onions, also. Maybe even for potatoes to have a spot on the counter. Roots and bulbs keep well if they are cool, dry, and well-ventilated. The loose weave of burlap does this job brilliantly. Why else have we been using this material for centuries for this very purpose?! I will be putting these stenciled versions in my shop on Friday morning and maybe some plain ones as well, if there is a request for that. The hanging sacks have two jute loops that have been reinforced to make them very sturdy for hanging. I added my twill label as a center loop, in case you only have one hook. The potato sack is made to stand up tall for a whole bunch or to hold a lot of long sweet potatoes. Just roll it down to size. I'd love your feedback on these new little designs. I value your opinion so much! See you tomorrow with more photos of the coffee sack buckets and more that will be available on Friday morning at 11am EST. Hi, I'm new to your blog. I found it via the pillowcase dress tutorial. 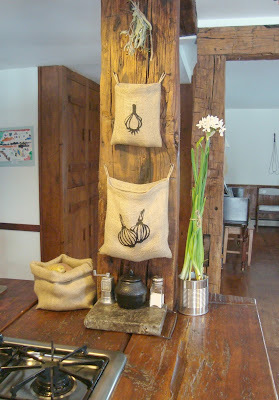 I really love these sacks and think they would look lovely in my own kitchen. Bravo! AHHHHHH!!!!!!! Those are AMAZING! I love them and am going to buy them, stat. I really love these maya. So beautiful and very very useful. I adore the form and shapes of bulbs. really cute! love the idea even though I have nowhere to hang anything in my kitchen..
*LOVE* the rough wood post in your kitchen! These are great, Maya!! And I love the stencils! Are these yours also? Very nice! Are they washable? 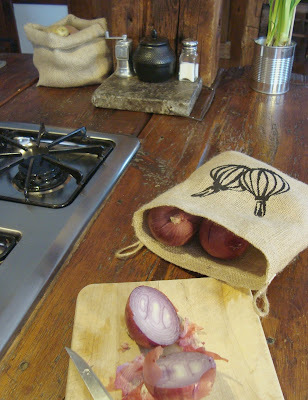 Sometimes I have an onion or a potato that goes really, really bad (oops) and I wouldn't want to throw the bag away...just curious. oh my word, my opinion is that all these sacks are genius ! Plain or with a design on the front, I'm pretty sure they're going to sell like buns !! You are brilliant ! I love this idea and would love to buy some! very cool! Did you use freezer paper to stencil on the burlap? 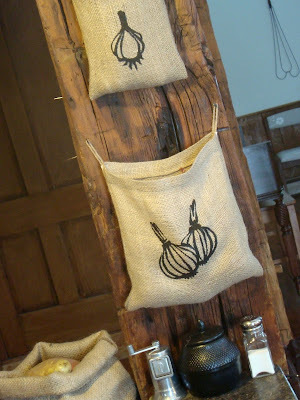 I'd be really interested in a "stenciling on burlap" tutorial! These are perfect, and my gosh, wooden counters? I love that!! Absolutely adore these. I currently use a pull out plastic drawer. These would be so much more attractive and take up much less space. Absolutely great! We keep two baskets (but under the sink, which happens to be the worse place to keep them) with onions, garlics and potatoes. But they are plastic! 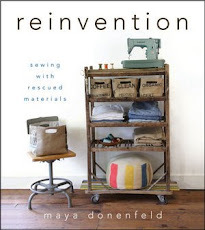 What a fantastic idea - but where do you get all your burlap from? It's not so easy to find here in the UK, otherwise I'd be running a couple of these up for myself! Love the site, I always have a look to see what you're up to! This is brilliant. I love, love, love them. Gorgeous - I love them! Wow, love these little bags. I have an open pantry and these would be a nice visual. Sounds like Friday is shopping day! These are sooo great!!! I just love all your ideas and your blog. Keep it comin'! Maya, these are AMAZING!!! I love that they are gorgeous and so practical. The stencil design you incorporated to each one is darling. What a fantastic addition to the shop! What a great idea, and so attractive to have in your kitchen too. They look great in your kitchen with all the rustic wood! the potato sack is great! Well done on another great idea! 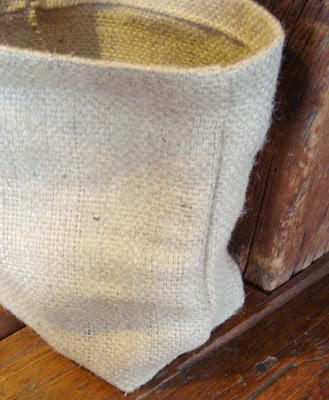 I bought one of your burlap buckets for my boyfriend for christmas and he adores it-- he has taken to using it as some sort of man-purse and carries it around with him everywhere (holding things like his book, wallet, notepad, pens, water bottle). Thanks! I hope I have a good place for them in my kitchen. I will be buying some if I do. Nice!! The root and bulb sacks are perfect! I have my garlic, onions, and potatoes all jumbled on the counter in a clementine crate--very messy and I can't find any garlic half the time. The burlap hanging sacks are such a great idea to get me more organized. I have just the spot to hang them in, too. 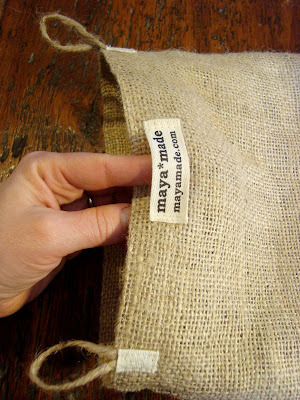 I bought some coffee sacks at the coffee shop close to my house, so I may try to make these. Of course they won't have the gorgeous stencil print on them! And the burlap isn't nearly as nice as the stuff you found. But it's a start! To your UK commenter above ("bunting")--burlap is known as Hessian in the UK. And it can be spot cleaned. As a newbie to this blogging world, your inspiring site is one I now need to return to regularly. You truly have made a difference feeding my spirit and soul. The burlap has great texture and simplicity and your ideas are amazing. Looking forward to Friday. These are truly fantastic. My summer haul of onions and garlic got a little mushy about a month ago--these would have mitigated veg mushness. Thanks so much everyone! I'm making more! mimi charmante: you can go to my flickr site and click on my home set for a little more. The graphics are my free-hand drawn stencils onto freezer paper. A bit laborious, but I love it. Freezer paper on burlap is pretty much the same as any other textile. Atrid- as Zencrafter said... spot cleaning is best, but a little handwashing should be fine in a rotting kind of crises. The stencils are painted with fabric paint. I really like the garlic and onion bags. Mom had a fine idea, didn't she? Oh I missed out! I went out of town this weekend and forgot to check back in. 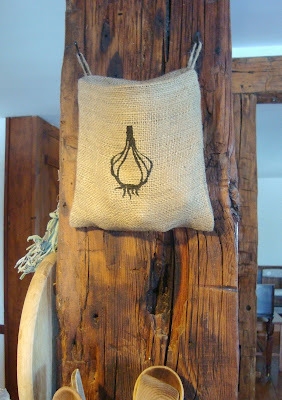 I LOVE the onion and garlic keeper bags! If you ever have those up for sale again, I think I'll try to snag one of each! These are brilliant! I love them. Thank you so much...This idea sprouted one for me. I made little bags with pictures of socks and underwear on them for my niece and nephew who's parents have split. For some reason they never remember to pack their socks and underwear when they leave their mom's house. I made little bags with pictures for their suitcases. Maybe that will help them out. Thanks again!